This summer I have had my eyed glued to the Olympics in Rio 2016. A summer of sport filled with colour, beautiful backdrops in Rio for our Olympic and Paralympics athletes. Never has Team Great Britain had so much success in the same Olympic Games. We came second after China who has the biggest population on the world! Never have I been so proud of my country! Also knowing that if Manchester would have been classed as its own individual country, we would have ranked 4th out of 206 countries! Amazing! Me and my family are big fans of the games and always watched every 4 years. We usually watch the athletics, swimming, gymnastics. This year I found myself entranced with all different events. My favourite being the fencing, boxing, Judo & Tae Kwon Do. The passion & determination in these events were fierce. More than one time hanging on the edge of my seat and running to grab a cold beverage when a break came on. For me this year one of the most amazing stories was Lutalo Muhammed (Team GB) who fought in the final against Cheick Sallah Cisse from the Ivory Coast. Mohammed lost his fight at the last second when Cheick came in with a reverse turning kick, losing by One second!! Which came between Muhammed winning the Gold for team GB. Silver is an amazing achievement which has been the highest medal they have ever won in Tae Kwon Do in any Olympics! I think you did amazing Muhammed and the gold will be yours in Tokyo 2020 I know it! Other highlights in Rio 2016 were Jason Kenny and Laura Trott the golden couple of the cycling at the Velodrome. Between them winning 10 medals across 3 Olympics. 6 of them GOLD! The atmosphere watching them compete in the cycling events was amazing in Rio (especially the team pursuit and keirin) What I liked about this couple is when they were interviewed, they always came across very humble and down to earth. She said he proposed to her on Christmas Day in 2014, while they were both sat on the sofa in their pjs watching TV. Cute! They both train at the Manchester Velodrome and won 5 medals for Team GB this summer. Looking forward to seeing them again in Tokyo! The summer in Rio 2016 has been amazing! Never have I cried and celebrated so much at with Team Great Britain ups and downs. When they announced the parade was coming to Manchester I couldn’t have been more proud to help welcome them home and to our great city. Manchester City Council put on a fantastic parade! I knew I had to be part of it! 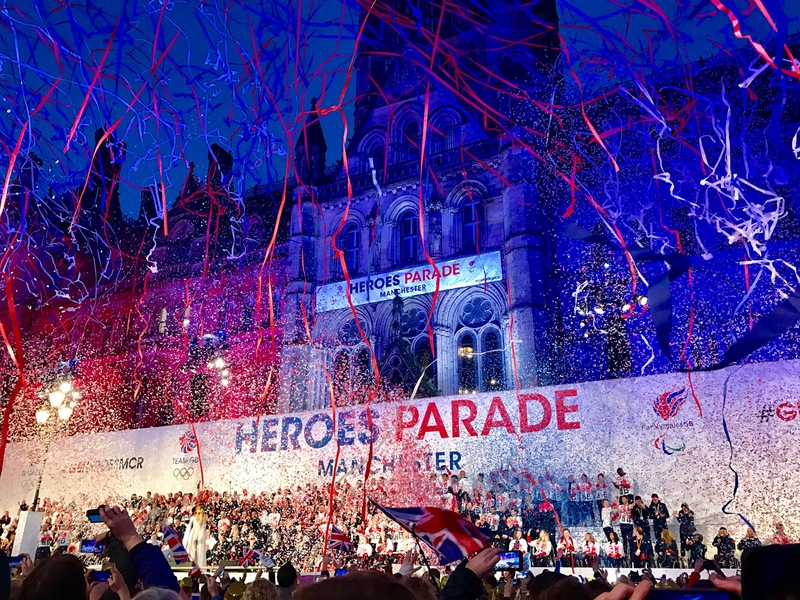 Walking up to the Manchester Town Hall was buzzing with 100,000 people packed out the square with their children despite the weather to see our champions. As I walked up the different teams were interviewed on stage about their journeys and stories. It was nice to hear. Especially when the Paralympics athletes came on stage (channel 4 named them the 'super humans') who have had to overcome so many obstacles in general life, never mind competing in an Olympic games. These athletes are truly remarkable! I partcularly enjoyed the stories from Brownlee Brothers and Ellie Simmonds. I had heard Olly Murs had pulled out of the performance early the same day. The council quickly rocked in the Kriser Chiefs good replacement! Rebecca Ferguson also a good choice performance wise. At the end we congratulated all of our Olympians and Paralympics, who all came out on stage. Streamers and glitter and fireworks also went off in true Manchester style. Our town hall turned red, white and blue too! The atmosphere was electric everyone around me was smiling in their wet rain jackets. I have never felt prouder to be British as I did in that moment! The smells from a local BBQ restaurant giving out free hot food, I was surrounded by giant sponge lottery hands, gold hats and people in gold wigs which had all been given to them and our flags waving around. Looking around seeing our future children being inspired by what athletes were saying and how to get involved in sport. The whole parade was an amazing experience and something which I will never forget. Perfect to top off an unbelievable summer for Team GB in Rio 2016. Manchester welcomed you home in style.